You can check out my review of Adriana Mather’s fantastic debut novel, How to Hang a Witch HERE. Sam and The Descendents are back in another spine-tingling, atmospheric adventure. Adriana Mather’s stories appeal to the side of me that wants to suspend reality and languish in a world of magic, ghosts, romance, high-school, and haunted histories. Haunting the Deep was every bit as fun as her debut novel. 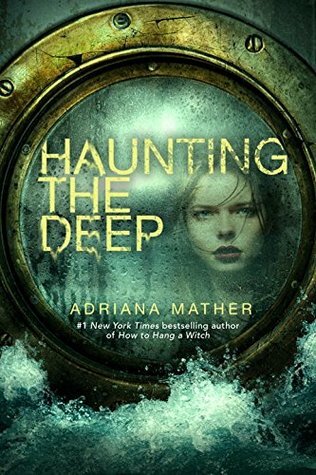 Haunting the Deep is second book in the How to Hang a Witch series, and it is my opinion that you DEFINITELY NEED TO READ THE FIRST BOOK to understand everything that is going on in book two. If you do not, the first chunk of this book may be confusing. Once again, I was entranced by Adriana Mather’s attention to detail. Her story worlds, past and present, are rich and are my favorite aspect of her writing. Split between Salem, Massachusetts, and a pre-catastrophe Titanic, set in another dimension, Sam’s story moves beyond her coven and witchy past when she discovers that some of her relatives were on the fateful Titanic shipwreck. When the school dance committee chooses the Titanic as the dance theme, some strange things start to happen in Salem, especially to Sam and her friends. Notes, packages left on doorsteps, secret family history, and the mysterious town shut-in all come together to make Haunting the Deep feel like a nostalgic episode of R.L. Stine’s The Haunting Hour. There is a lot of friend and family drama thrown into the mystery that sets the scene for Sam’s Titanic adventure. This series “has make me into a television show” written all over it. Adriana Mather pulled from her own family history to create this story, and OMG-that is so much fun. The historical detail about the Titanic and its passengers were well researched and integrated into the story. All of the supporting characters, including Sam’s love interests, return from the previous novel, and the addition of a few new mysterious figures are added to the cast. The pace of novel is slower than the first, but still exciting and suspenseful. The love-triangle that was set up in the first novel grows even more complicated in Haunting the Deep when Sam makes a shocking choice. The first novel in this series evoked memories of The Craft and Mean Girls, and this novel added to that fantastic mix with vibes of Titanic starring Leonardo DiCaprio and Kate Winslet. History buffs, historical fiction enthusiasts, and young adult fiction lovers will all enjoy Adriana Mather’s entertaining and informative novel. I highly recommend it. Have you read How to Hang a Witch or Haunting the Deep? I would love to hear your thoughts on them in the comments section below!